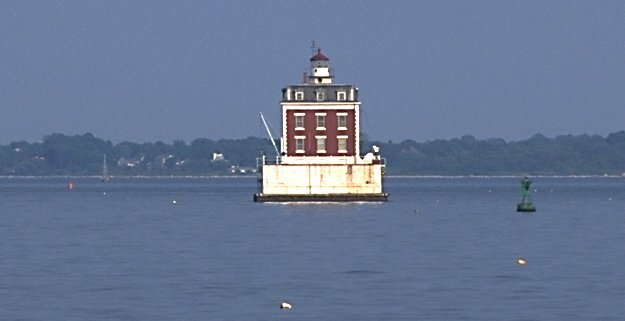 This light is an oddity: a three-story French Second Empire mansion dropped into the middle of New London Harbor. The light was built in 1909, when the older New London Light was deemed inadequate. The small cylindrical tower which rises from the mansion's roof originally housed a fourth-order lens which rotated in a pan of mercury, but this was replaced in 1984 with an automated beacon. New London Ledge Light has been reputed to be haunted ever since the 1930's. The keeper then lept to his death on the ledge when his wife ran away with the captain of the Block Island ferry. Restoration is under way, with plans to establish a museum. The light can be viewed from Ocean Beach, or from the Block Island Ferry, which passes nearby.